Archeologists have long traveled under the assumption that what we call the human race—the African hominids known to science as “homo sapiens”—evolved roughly 200,000 years ago in either southern or eastern Africa. Starting perhaps as early as 100,000 years ago, they migrated out of Africa and eventually displaced the European and Asian hominids known as Neandertals (sometimes spelled Neanderthal). That was the prevailing theory until recently, when scientists announced that they had unexpectedly turned up some very old bones—the remains of recognizably modern humans dating back 300,000 years, 100 millennia before any of us were supposed to be around. 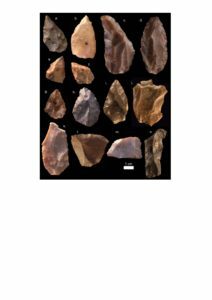 Even more surprising, the now-earliest evidence of homo sapiens was discovered in north Africa, not far from the city of Marrakesh in Morocco. Not only were humans around much longer than anybody realized, but by that ancient time, they had apparently spread all over the African continent. The archeological expedition turned up several remains, with brain cases as large as modern humans, plus stone tools (see image) that were carefully shaped by ancient craftspeople living far earlier than anybody suspected.